In our times the PLCs have been seen as giants, the backbone of commerce and society. Yet seen through a historical perspective they are vulnerable creatures, flowering only briefly. In fact, on the Fortune 500 – a roll-call of power if ever there was one – there’s just one company, General Electric, which was on the list half a century ago. The rest have gone : broken, bankrupt, merged, raided for their parts. More like mayflies than megacorps. And getting more fragile all the time. 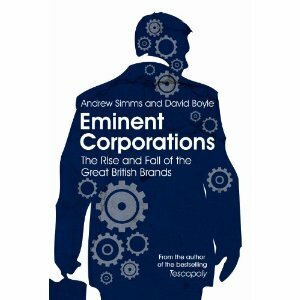 Eminent Corporations, a new book by Andrew Simms and David Boyle, spills the beans by telling the real life stories of some of the biggest corporate names, and finds them as dramatic, flawed and revealing as any human biography. Andrew and David will be joined by Nick Robins, director of HSBC’s Climate Change Centre of Excellence and author of The Corporation That Changed the World, a history of the East India Company. It includes histories of BP (up to and including the disaster in the Gulf of Mexico), Barclays (up to and including the banking collapse), Cadbury (up to and including their takeover by Kraft), M&S, Rover, Virgin and more.